Mama Red has held hooves to this earth for two decades and a handful of years. As close as we can recall, my daddy bought her from a farmer downstate in South Carolina in the early 90s and brought her to live on his farm in Anderson. 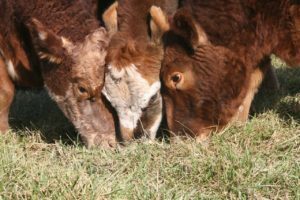 Daddy wanted a breed never before seen in his home county, the exotic Santa Gertrudis, a tropical beef breed of cattle developed in southern Texas on the King Ranch. The breed is large, much more so than the standard Hereford or Angus. But you can look at Mama Red’s face and see she is mixed with another breed, one with white on the face. Hereford, for example. 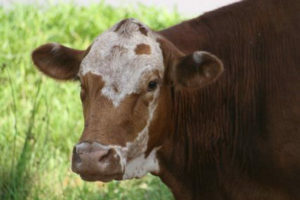 Mama Red’s face is mottled, meaning it carries two colors – hers red brown and white. Or, at least, the color used to be white. Now it’s a taupe-colored gray. My best guess is Mama Red is 25 years old. You realize a mama cow’s reaching such an advanced age is almost unheard of, don’t you? Most, mama cows, when they stop reliably producing a calf every year (they’re like us humans with a nine-month gestation), these mama cows are sent to slaughter, no longer being of use, except to eat. Hamburger, mostly. Enter Mama Red into my life one glorious early morning in November 2008. I was asleep in my Daddy’s house and awakened by sounds that drew me outside to a gathering of vocal mama cows, huddled in the corner of a barbed wire fence. They were calling for their babies, also huddled several yards away up a lane of grass, these babies having been weaned from their mothers the afternoon before. This is common practice to take calves away when they are between six to eight months old. Why? Because the mama cow likely is already “carrying,” – that is, pregnant, and needs the milk for the new baby inside her. But these mothers, gathered at that fence, their eyes pleading with me to bring their babies back. I knew I couldn’t, but I could tell their story, one of a mother’s love. The mama cow in the deep corner, I looked at firmly and made a promise. “I will tell your story,” I told her and named her Mama Red and made her the centerpiece in my novel, One Good Mama Bone. But, then, because she missed her next pregnancy, my Daddy was going to sell her. I bought her from him for the amount he would have received for her at the sale, $1000. Mama Red now had “sanctuary,” allowing her to ride out her days on the farm. And guess what happened two years later? She birthed twins, Baby Boy and Baby Girl. They, too, have sanctuary. They are six years old now, these twins, and they are inseparable. Most times, when I go to look for them, the three of them are together, even among a herd of five dozen. Still a family. People say to me, “Oh, I didn’t know they would stay together like that.” That’s because most bovine families are not allowed to stay. They are sold off. An interesting note about twins. Most are sterile, because of the goings-on inside the womb as they are growing, a mixing of hormones. Baby Girl is definitely sterile – never been pregnant. That makes her a “freemason.” If she were not in sanctuary, she would be long gone, since she would not be earning her keep. Same for Baby Boy, being a steer (a neutered male). Of no use, except to eat. He likely would have made it to age two, about the time most steers are considered “fed out” to bring the highest price at sale. But Mama Red is much bigger than being a mother to her twins or any of the other offspring she birthed over the years. Mama Red is supreme mama to the entire herd. I have watched, on several occasions, the cows lining up near her, waiting their turn for the space to open up in front of her. And when it does, each steps forward towards Mama Red and holds still, while Mama Red begins to lick them, always in long, slow strokes up the cow’s neck. The cow’s head, held high at first, lowers in time, in surrender. The herd leader. The one most revered. The sacred mother. This is Mama Red. 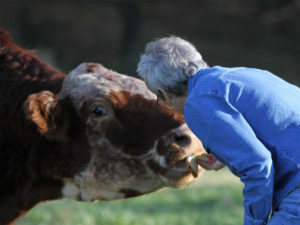 The cow I made a promise to, now living out her days, eating plentiful grass and occasional loaf bread, which she adores. How much longer can she live? Only God knows. But my prayer is she’ll hold hooves to the earth for many more years to come.